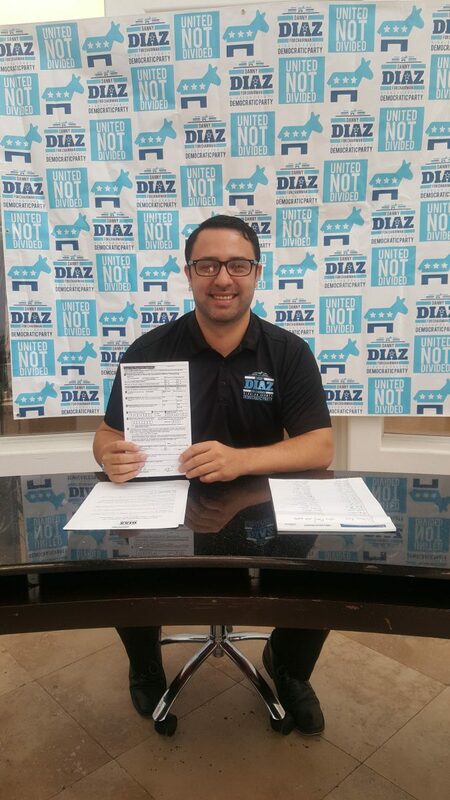 McALLEN — A high school counselor officially announced his candidacy for chair of the Hidalgo County Democratic Party on Monday. Danny Diaz, a financial aid specialist at the La Joya Independent School District, is running under the slogan “United Not Divided,” which he said reflects his goal of bringing together the county’s democratic factions around shared goals of anti-discrimination, quality education and increased opportunity. Diaz, 30, previously worked as a community organizer for LUPE (La Union del Pueblo Entero) and has been Democratic chair for Precinct 78 since 2012. He decided to run for the county-level position after current chair Ric Godinez decided not to run for re-election. He said he plans to increase voter turnout in Hidalgo County by recruiting more democrats to serve as precinct chairs, registering first-time voters and encouraging those who haven’t been active in politics to participate, and creating more Democratic Party clubs. This isn’t his first campaign. In 2016, he unsuccessfully ran against Joe Flores for Precinct 3 county commissioner. Diaz will face Norma Ramirez, the Precinct 69 chair who announced her candidacy in August, in the March 2018 primary.